We've fallen out of lamb-chop love in recent years for a couple of reasons. One is the fatty, chewy and generally sub-par chops available at most of our local stores. The other is that I've always been an open-fire lamb cooker. I like my chops charred over a real flame, just the way Dad made them. But we don't fire up the grill much when we're cooking for just the two of us, as is almost always the case these days. We try to keep things simple, which translates into stove-top prep. That generally entails few sacrifices, but lamb chops, sadly, have become one of them. Until the other day, that is, when I spotted three particularly nice shoulder chops that looked perfectly marbled and nicely trimmed. My first thought was to head for the charcoal aisle but I'm happy to report that the thought passed quickly. Instead, I decided to pan sear the lamb along with the fixings. 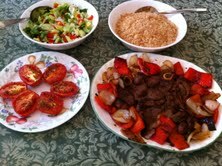 I started by making an Armenian-style side salad and getting my bulgur pilaf on the stove. I set the salad aside to dress right before serving and let the pilaf fluff up in its own juices, with the pan's top firmly in place. Then I put a 12-inch Teflon skillet on the stove and turned the heat up high. 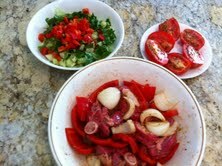 While the pan warmed up, I cut up a large onion and two fat, red bell peppers just as I would if I were barbecuing. I tossed them in a bowl with two crushed cloves of garlic, my usual kebab seasonings (use the ones you like) and just enough olive oil to coat it all. The peppers and onion went into the hot pan to sizzle while I rubbed the chops with the same seasoning mix and then added just enough oil for a similar coating. As the veggies were starting to brown, I added the meat to the pan. The only exception to the stove-top portion of the menu resulted from my running out of room on the stove: Robyn broiled a few tomatoes in the toaster oven while I monitored the lamb chops. How long does it take to cook lamb chops? The answer varies. If you're not Armenian, it takes about four to six minutes per side. I know because I heard this from a professional chef on the television. I made a mental note of the time, and a second note never to eat in this guy's restaurant. If, however, you are Armenian, cook the chops until they're actually done and then cook them some more. For me, that's about 15 minutes total but be my guest to keep going. I got a nice, even char on both sides that won the ultimate compliment from our kitchen's executive chef, who happens to be my wife: She said the meat looked and tasted grilled. What turned out looking like an elaborate meal was actually quick and easy to prepare --- and so satisfying that the outdoor grill may stay cold a while longer. PS: This menu is perfect for an Easter dinner for 2 or 3. Mouth watering item. I especially liked the "quiz." Although, yes, I will eat the lamb chops any way you cook them. Hi Douglas - Thanks for recommending cookware with Teflon® nonstick coatings while making your Pan-seared Lamb Chops! I represent DuPont and it's always a pleasure to see people recommending our products in their recipes. As someone searching for an Armenian grilled lamb recipe, it would have been helpful for you to write how you season the lamb. Also, Teflon on high heat is dangerous, even dupont doesn't recommend it. Thank you for pointing this out! A link has been added which will lead you to a post with kebab seasonings.